Place the sundried tomatoes in a bowl and cover with boiling water. Set aside. After 5 minutes, drain the tomatoes and discard the water. Place the sun-dried tomatoes and garlic in a food processor. Process until almost smooth. Add the balsamic vinegar and olive oil. Blend until the mixture is smooth. Set aside. Preheat the grill on high (550-600°F/290-315°C) for 10 minutes with the lid closed. Using a pair of long handled tongs, oil the grate by wiping it with a piece of folded paper towel dipped lightly in canola oil. Grill the beef patties about 5 minutes on each side or until the internal temperature registers 160° F (71°C) on an instant-read thermometer. 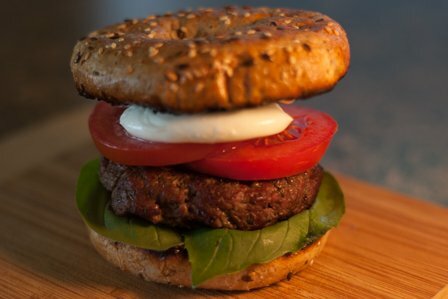 While the patties are cooking, cut the bagels in half and brush each cut side with olive oil. Toast the bagel halves cut side down on the grate until golden brown, about 2 minutes. Place the toasted bagel halves open-faced on serving plates. Spread all 8 bagel halves generously with the sun-dried tomato mixture. Place 3 basil leaves on the bottom half of each bagel. Place the cooked beef patty on top of the basil. Follow with the tomato and mozzarella. Leftover sun-dried tomato mixture can be kept in the refrigerator in a covered container for up to 1 week.